In 1937 I was a nine-year-old living on the fifth floor of a six-story walkup in the Bronx. One warm day I went to open the kitchen window and I heard a great deal of noise from the street below. When I looked down, I saw a crowd of people staring up at the sky and pointing. 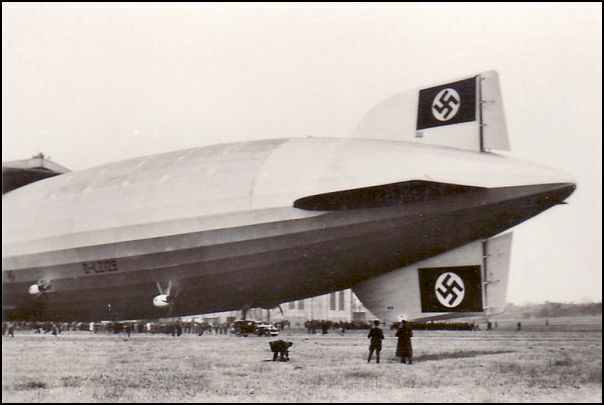 The massive German dirigible Hindenberg displayed large swastikas on its tail. As I turned my gaze to where they were pointing, I jumped back in horror, bumping my head on the window frame. Just above the rooftops of La Fontaine Avenue sailed the most gigantic behemoth I had ever seen, the dirigible Hindenburg. It was so enormous and flying so low I felt I could reach up and touch it as it glided by. I called out to my mother to come to the kitchen, and we stood side by side at the window. My Russian Jewish peasant mother was well aware of how Jews were being treated in Nazi Germany, and when she saw the swastikas on the zeppelins tail fins, she said in Yiddish, "Du zolst ontsindn vi a likht [May you burst into flame like a candle]." Later in the day, we heard on the radio that the Hindenburg had indeed burst into flame as it came in to moor at the Lakehurst Naval Air Station in New Jersey. My mother had often told me stories about her childhood in a tiny village in czarist Russia, a place where people believed in werewolves and the evil eye. As the broadcast ended, I turned to her and said, "Mama, what did you do?"